I know what’s it’s like to be with a mother-in-law who is overbearing and narcissistic. I can understand the obstacles you face. 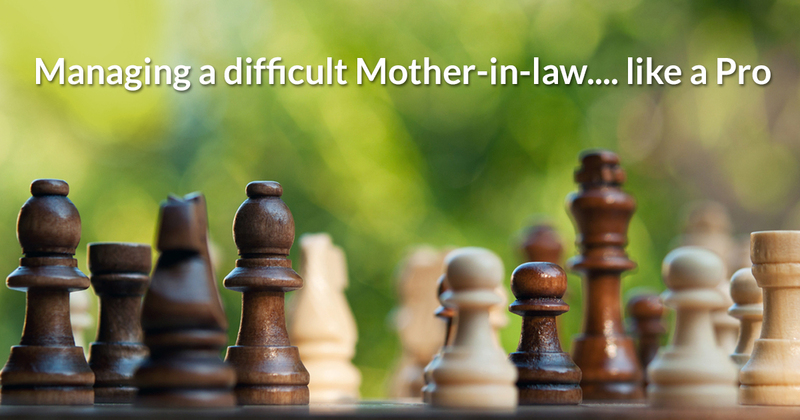 While not all mother-in-laws are unbearable, it’s a real headache if yours is not one of them. I have tried to list out some common problems faced by young wives and given possible solutions to them. Issue 1: MIL is obsessed with your husband & controls him. I know it hurts. Loving her son is one thing while controlling his life and getting over-possessive is quite another! From your mother in law’s perspective, she acts that way because she feels she is no more in charge of your husband’s life. She believes you have stolen her position as “the most important woman of his life” (which is actually true). That’s what leads to a kind of childish jealousy in her. Let her spend private time with her son. Let her know that you are not competing with her. Draw strict boundaries across. Your mother in law trying to peep into your personal matters is NOT OKAY. Talk to your husband about this. Make sure he does not let his mom allow in your personal matters. Don’t be adamant and hate your mother in law for this. Being polite can save many relationship issues that may crop up otherwise. Issue 2: Husband loves his mom more than wife. Dealing with your mother in law becomes quite a task when you don’t have your husband’s support. It’s absolutely mandatory that a husband gives primary importance to his wife. Try to see the underlying problem. What’s making your husband disinterested in you? Are you being romantic enough? Are your conversations getting dull and boring? Do you fight often? What is it about? Spice up your marriage a bit, especially if it has been a while since you got married. Make sure you are not hurting your husband by complaining or making rude remarks about your mother-in-law. If he’s too impatient to listen, then remind him that you are an independent lady who deserves respect and love. If you have to be stern, be. Let him know that priorities in life change from time to time. Make him understand that there’s nothing wrong in putting your wife first. Issue 3: MIL badmouths about you to her son. We’ve heard the horror stories of mother-in-law from hell. Complaining and badmouthing means she hates you. This is a big issue, but there’s hope. Because remember that she’s lost her battle. The best way to deal with this is to use a bit of politics here. Start loving your mother-in-law unconditionally and tell your husband that she’s the sweetest person you’ve ever known. Behave as if you are really cooperative and understanding. Best & wise solution: Ignore. Issue 4: MIL is jealous of your relationship with her son. Be polite but don’t get too emotionally attached. Never talk about your marital issues (good or bad) to her. Maintain couple’s privacy. Never complain about your husband to her. She may magnify the issue and taunt you. As said above, give your MIL some space and let her spend time with your husband. Assure her (with your deeds) that you are not a threat to the mom-son relationship. The best ways to minimise any sort disturbance with your mother-in-law is to be away from her. Issue 5: MIL inspects every little detail of the kitchen when she comes home. I know a woman who checks every part of the kitchen and refrigerator as soon as she arrives at her son’s place. She interrogates her daughter-in-law about how various things are done at her home. While some lenience is not bad, nit-picking on the minute details and white-glove-inspection session is definitely dominating. Politely tell her that you will take care of the household business, and ask her to cuddle up on the couch. Distract her by talking about something else and slowly drag her away from your kitchen. If she’s too adamant about it, get a little firm by stating that you don’t need her help. But be a little careful. Use please and thank you a lot, otherwise she may get offended. Lock the kitchen door while cooking. She’ll get the point. But use it at your own risk, keeping your mother-in-law’s behaviour in mind. Issue 6: Bickering in the kitchen where both ladies cook together. Having a cook/maid solves 90% of this issue. Neither of you get to criticize other’s work. If a maid is not possible, set a schedule. You can cook for 3 days while she does the cooking for the remaining 3 days. Let Sunday be a restaurant day or something like that. The rule should be: Only one lady should be allowed in the kitchen unless absolutely necessary. Pick seriously strict schedules and stick to them. If you have to fight over this, then fight. But take your husband’s support. Issue 7: MIL nags you with unwanted parenting advice. Don’t discard your MIL advice immediately. Listen to her with an open mind. After all, she’s more experienced than you are. If she suggests something against your will, politely thank her and let her know that you have made your own plans. If this gets out of control, clearly remind her that you keep your child’s best interests at heart. Use a slightly stern voice. Sometimes the best solution is to say “Yes” to whatever she says, and then do whatever you like. Issue 8: MIL spoils kids too much. Don’t block away your in-laws from meeting your kids. However, do limit their spending time. Draw smart boundaries. Engage the kid in some activities like drawing, swimming, making new friends etc. Don’t let them sit idle and let your mother-in-law pamper them with unlimited toffees. A little spoiling of kids is okay. Remember your own memories with your grandparents? Aren’t they totally sweet? Allow your kids have their own memories too. Issue 9: MIL gets tries to take charge of the kids. Talk to your husband about it. Communicate to her clearly about where she’s crossing the line. Let her know you and your husband are not okay with it. Issue 10: MIL criticizes you. Understand her true motives. Is her criticism constructive and fair? If so, you have to change your perspective and be positive. Stay confident. Don’t let her words affect you. Join a personality development class if you are being too sensitive. Defend yourself verbally. Don’t let people mistake your politeness to be your weakness. If something isn’t fair, voice out. As much as possible, don’t let little things turn into bitter arguments and fights. Here are common tips to have peace with your mother-in-law. Set clear boundaries. If being together is painful, get distant. Don’t look for your in-law’s approval in everything. Avoid incidents/conversations that trigger fights between you. Don’t try to compete and win over her; she’ll make sure your victory is short-lived. Talk less. Don’t get into unnecessary gossips. Have clear goals in your life and mind your business. Letting her enter the privacy of your marriage is only a recipe to disaster. Staying with a troublesome MIL not only spoils your marriage but also your mind. Plan to move out. If you are an Indian and facing MIL issues, I strongly recommend reading “The Mother-in-Law: The Other Woman in Your Marriage ” by Veena Venugopal.